This is an advanced ride due to the overall amount of climbing and the distance. This is a lollipop shaped route, riding out and returning along the stem. The loop segment can be ridden in either direction. 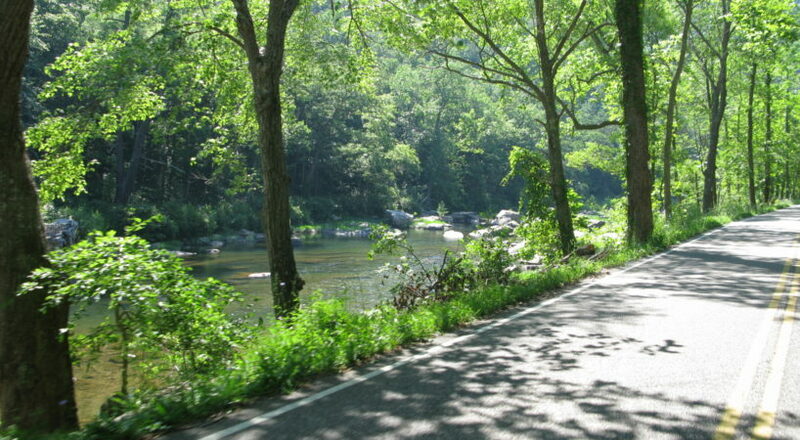 This is a classic and very scenic long ride starting in Lexington. There is a long climb to the top of North Mountain, then a much longer descent down through scenic Goshen Pass. It starts in Lexington and goes out into western Rockbridge County. This is a difficult ride with a long climb up North Mountain and rolling hills back to the start. This is an advanced ride due to the overall amount of climbing and the distance. The climb up North Mountain is about 7% for a little over a mile. There is some truck traffic on the back side of the Mountain on Brattons Run. Both Midland Trail (Route 850) and Route 39 are 55 mph speed limit roads. On a nice weekend day there can be substantial automobile traffic on Route 39 near Goshen Pass. BE VERY CAREFUL and wear high visibility clothing. Goshen Pass is the highlight of this loop; it is a boulder strewn segment of the Maury River; large rhododendrons line the roadside. When the water is high kayakers often are out in the water. 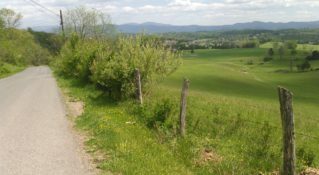 This loop also runs through forest as well as field and farm habitat – one is as likely to see a blue heron near Kerrs Creek as a red tail hawk on a telephone wire along the road. There are two public parking lots, the second, on the right, is adjacent to a public restroom. 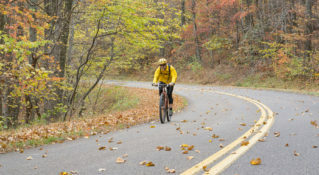 This is a lollipop shaped loop, riding out and returning along the stem – the split occurs at the intersection of Fredericksburg Road and Midland Trail – the loop segment can be ridden in either direction. Clockwise has the North Mountain climb and the 12 mile descent through Goshen Pass, so most riders choose that direction. 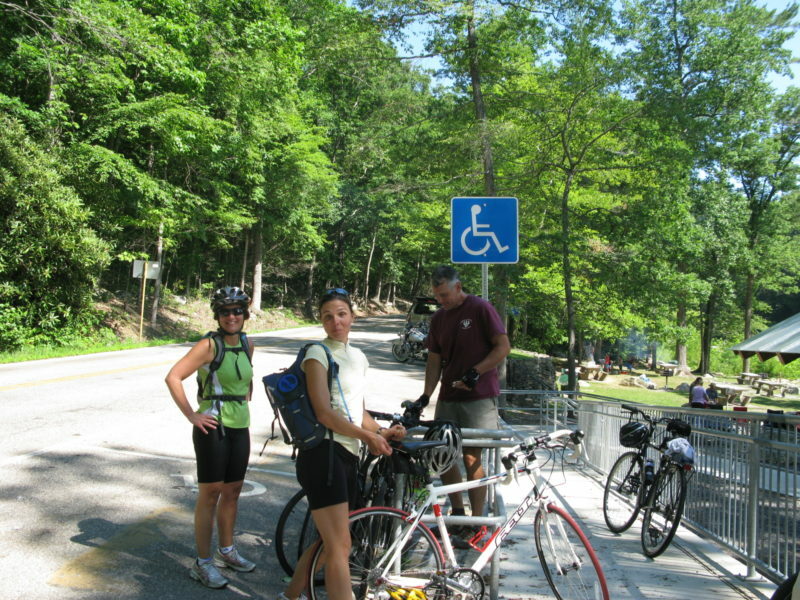 Route starts in Lexington at Jordans Point Park with few opportunities for services on route. The town of Goshen is about a mile off-route. At mile 23.9 turn left and go west on Route 39 from the intersection of Brattons Run and Route 39. There are a couple of gas station-convenience stores and restaurant in Goshen. Lexington has many services in town. This is a long route with limited facilities along much of it. Picnic areas are available at Goshen Pass. Source your lunch locally with healthy, freshly prepared to-go options at Cool Springs Organic Market or visit BG’s 2 for drinks, snacks, hardware items and gasoline. A roadside marker at the Goshen Pass Wayside honors former Virginia Military Institute professor Matthew Fontaine Maury. Maury was a 19th-century oceanographer and mapmaker whose research revolutionized maritime navigation.